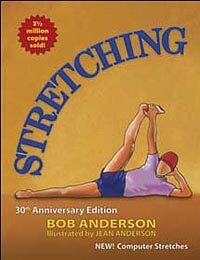 I haven’t encountered any source on this subject as broad, accessible, and easily applied as Bob Anderson’s classic Stretching, a patient and friendly stand-in for my eight-grade P.E. teacher. Organizationally, Stretching shines. Tight neck? Rigid shoulders? Thumb through to your prescribed routine and get to work. With minimal flexibility but a willingness to make an effort, almost anyone can use this book to become more limber, healthier. 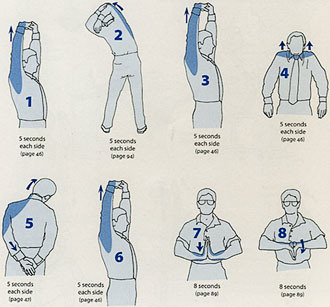 Stretching feels good when done correctly. You do not have to push the limits or attempt to go further each day. It should not be a personal contest to see how far you can stretch. 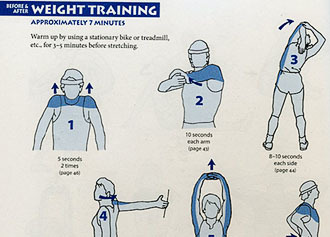 Stretching should be tailored to your particular muscular structure, flexibility, and varying tension levels. The key is regularity and relaxation. The object is to reduce muscular tension, thereby promoting freer movement—not to concentrate on attaining extreme flexibility, which often leads to overstretching and injury. Everyone can learn to stretch, regardless of age or flexibility. You do not need to be in top physical condition or have specific athletic skills. Whether you sit at a desk all day, dig ditches, do housework, stand at an assembly line, drive a truck or exercise regularly, the same techniques of stretching apply....if you are healthy, without any specific physical problems, you can learn how to stretch safely and enjoyably. - Make strenuous activities like running, skiing, tennis, swimming, and cycling easier because it prepares you for activity; it's a way of signaling the muscles that they are about to be used.